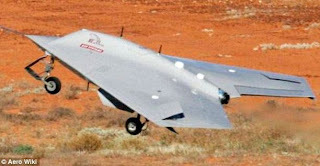 A military source in Tehran on state television has told that Iran's military has shot down a U.S. reconnaissance drone aircraft in eastern Iran. Iran has threatened to respond to the violation of Iranian airspace, the military source added. The drone is said to be RQ-170 type. The downed drone with little damage has been seized by the military, Iran's Arabic-language Al Alam state television network quoted the unnamed source as saying.